Middle-distance runner Lindsey Butterworth continues to inch closer to Canadian history in the 800 metres after posting a personal-best time of two minutes .87 seconds Sunday morning at the national championships in Ottawa. The victory at sun-drenched Terry Fox Stadium automatically qualified the North Vancouver, B.C., resident for the NACAC championships Aug. 10-12 in Toronto that will feature athletes from 31 countries throughout North America, Central America and the Caribbean in 40 different track and field events. "A PB and first place, you can't get any better than that," a thrilled Butterworth told AthleticsCanada.tv. "I knew I was in great shape and a [PB] was possible. "I didn't really have a [race] plan. It was just being confident in my fitness." Butterworth topped her previous PB of 2:01.13 at the Festival of Miles meet in St. Louis on May 31 and was coming off a 2:02.47 winning effort on June 27 at the Harry Jerome International Track Classic in Burnaby, B.C. The 25-year-old plans to race twice in Europe before returning home for a short rest before competing at NACAC championships. She is closing in on the two-minute milestone that only five Canadian women have reached, including 2017 national champion and Canadian-record holder Melissa Bishop, who gave birth to her first child, daughter Corinne, on Monday. Butterworth also gained a measure of revenge on Jenna Westaway, who finished second to Bishop in Ottawa a year ago in 2:03.88 while Butterworth was third in 2:04.34. On Sunday, Westaway finished behind Butterworth in 2:01.61 while Maïté Bouchard (2:01.94) rounded out the podium. With her focus of late on acceleration off the start line, Butterworth took the early lead Sunday before Kristen Metcalfe jumped ahead after 400 metres. However, Butterworth, the former star runner at Simon Fraser University, went ahead to stay near the 500-metre mark and looked strong on the straightaway. 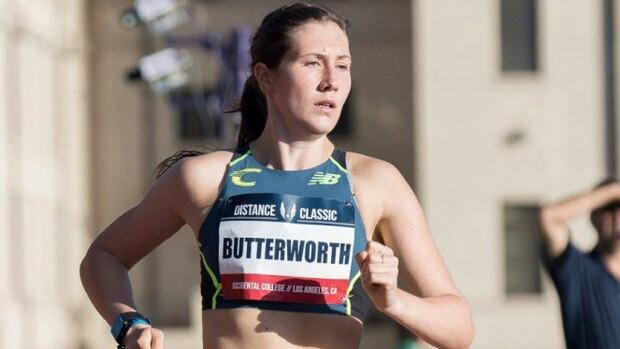 Butterworth opened the outdoor campaign at the end of March with a win at the Stanford Invitational in Palo Alto, Calif., where she ran 2:04.25 one day after setting a PB in the 1,500 "to set the tone" for her ensuing races. Elsewhere on Sunday, Edmonton's Marco Arop upended defending men's 800 champion Brandon McBride in 1:46.15, less than one second off the Mississippi State athlete's season and personal best of 1;45.25, set a month ago at the NCAA championships in Eugene, Ore.
"It's a feeling that I can't even explain," Arop, coming off a winning time of 1:47.09 at the Harry Jerome Classic, said of running in the lead. "I was so afraid of Brandon, I thought he was going to out-kick me with 200 to go, and that just encouraged me to kick even harder. "I could just feel him there, he's so much stronger than I am, he has that kick, but today just wasn't the day for him." Arop, 19, led wire-to-wire to win the Canadian title in his senior debut. "Everything is going right for me right now," he said through a wide smile. "I can't believe this is happening." The six-foot-four Arop had dabbled in track in elementary school and junior high, but had hitched his college dreams to a basketball scholarship until the track coach at Blessed Oscar Romero High School convinced him — finally — to run track in his Grade 12 year. He then delayed college for a year to work with coach Ron Thompson at Edmonton's Voleo Athletic Club. And last month, in his freshman season for Mississippi State, he raced to a surprise silver medal at the NCAA championships, crossing in a fast one minute 45.25 seconds. McBride stopped the clock in 1:46.42 after posting a winning time of 1:45.23 in Ottawa a year ago. The 24-year-old hinted at some recent upheaval in his life, on both the personal and track side. "No excuses though, my legs just didn't have it in the last 100 metres like they usually do," McBride said. "No excuse, I just didn't have it." Hamilton's Robert Heppenstall was third in 1:49.68 coming off his junior season at Wake Forest University in North Carolina. Meanwhile, Gabriela Stafford and Charles Philibert-Thiboutot won the women's and men's 1,500 for the third year in a row. Gabriela went head-to-head with her younger sister, Lucia, and prevailed in four minutes 17.08 seconds. Lucia finished ninth in the field of 12 in 4:21.31, nearly three seconds slower than her time in the preliminaries. A 2016 Olympian, Gabriela qualified second in 4:17.67 on Saturday, one month after placing second in 4:05.83 at the Music City Distance Carnival in Nashville. The 22-year-old University of Toronto psychology major has a personal best of 4:03.55, set in Berlin last August. Lucia, 19, is a second-year engineering student at U of T who posted a 4:09.17 PB in Nashville. Winnipeg's Nicole Sifuentes (4:17.71) and Katelyn Ayers (4:18.59) of Orillia, Ont., were second and third, respectively, on Sunday. Thiboutout, 27, crossed the line in 3:46.19, 75-100ths of a second ahead of 2015 Canadian champion Thomas Riva. The Quebec City native won in 3:55.75 at nationals in Edmonton in 2016 and shaved more than 10 seconds off that time (3:45.32) in Ottawa last year. Thiboutout made his Olympic debut in 2016 at Rio, where he finished 16th overall after advancing to the semifinals. Corey Bellemore from the University of Windsor placed third on Sunday in 3:47.11, more than six seconds faster than his qualifying time of 3:53.15. The 23-year-old's impressive 2018 season includes a personal-best 3:40.10 that Bellemore established three weeks ago at the London 1,500m Night. Last week, he stopped the clock in 3:41.84 at the Harry Jerome Classic. Brittant Crew, who made history last summer as the first Canadian woman to throw in a world shot put final — she finished sixth — added another national title to her resume on Sunday morning. Crew's winning throw of 18.27 metres at Terry Fox Stadium was over a metre better than the rest of the field. Crew's victory was also a rare chance for her mom Kimberley to see her compete in a big meet. Crew's younger brother Luke is autistic, and so can't attend meets with big, noisy crowds. "It's nice for mom to have a break and come here and just focus on me, because for the past five years it's been all about him. She's happy to be able to get away," Crew said. Luke watches Crew's international meets online. She hopes her mom can attend the 2020 Tokyo Olympics, and might start a GoFundMe page to cover the costs. Two weeks ago, Crew threw 18.60 metres to break her own Canadian record in her first meet of the summer.